2018 Toyota RAV4 vs. 2018 Ford Escape: Which Is Better? Both of these vehicles have been around for a while. Star Wagon. Super Exceed. Chamonix. Jasper. Active World. 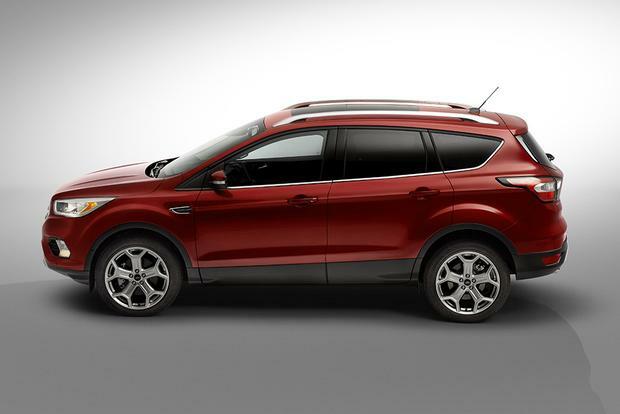 The 2018 Ford Escape has to be on the list of anyone looking to buy a compact crossover. 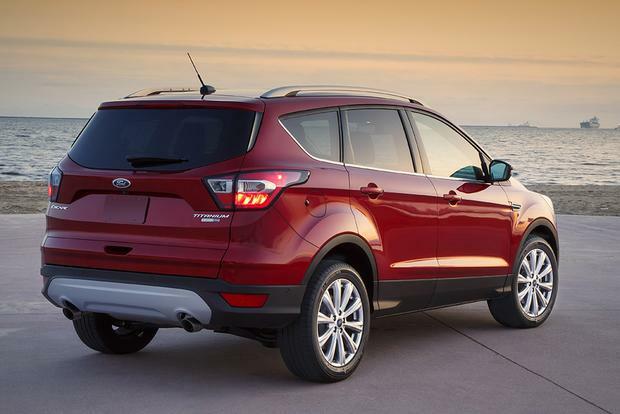 This corner of the automotive world is crammed with great choices, but the Escape is a star player. It offers appealing engines, decent cargo space, the option of all-wheel drive and a nice line of technology, such as a rear cargo door that opens automatically when a foot is waved under the bumper. The Escape can even parallel park itself. It also comes with a built-in fun factor, because it's based on the Ford Focus. That's why the chassis manages to have a sporty personality but can still remain comfortable. That second consideration is important, as a fun factor isn't such a big deal when there's a kid asleep in the child seat. The entry-level S is powered by a 2.5-liter 4-cylinder engine making 168 horsepower and 170 lb-ft of torque. This drive goes to the front wheels. Fuel economy is 21 miles per gallon in the city, 29 mpg on the highway and 24 mpg in combined driving. All-wheel drive is not available with this engine. Moving up to the SE means a 1.5-liter EcoBoost turbocharged 4-cylinder engine rated at 179 hp and 177 lb-ft of torque. Fuel economy checks in at 23 mpg city/30 mpg hwy/26 mpg combined with front-wheel drive and 22 mpg city/28 mpg hwy/24 mpg combined with optional all-wheel drive. A 2.0-liter EcoBoost turbocharged 4-cylinder engine with an impressive 245 hp and 275 lb-ft of torque comes in the Titanium trim. Fuel economy is 21 mpg city/28 mpg hwy/24 mpg combined with front-wheel drive and 20 mpg city/27 mpg hwy/23 mpg combined with all-wheel drive. Ford recommends using premium fuel with these turbocharged EcoBoost engines. Regular fuel will reduce power output slightly because of the lower octane. A 6-speed automatic transmission is standard throughout the range. 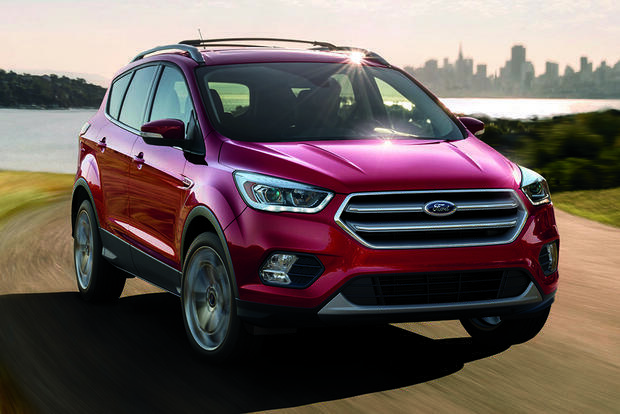 The 2018 Ford Escape comes in S, SE, SEL and Titanium trim levels. The base S ($24,845) includes cruise control, a tilt-telescopic steering wheel, air conditioning, a rearview camera, LED taillights, integrated blind spot mirrors, a SYNC voice command system, Bluetooth, a 6-speaker audio system with a 4.2-in screen and a USB port, reclining rear seats, a MyKey programmable key fob (which allows parents to set limits on radio volume and top speed) and 17-in steel wheels with plastic covers. The SE ($26,600) adds 17-in alloy wheels, roof rails, upgraded cloth upholstery, heated front seats, a rear center armrest, exterior keypads for the door locks, satellite radio, an 8-way power-adjustable driver's seat with lumbar adjustment, fog lights, automatic headlights and the turbocharged 1.5-liter EcoBoost engine with a stop/start function. Options for the SE include voice-activated navigation, rear parking sensors, 18-in alloy wheels, dual-zone automatic climate controls, a 110-volt power outlet, an upgraded SYNC 3 system with Apple CarPlay/Android Auto smartphone integration and an 8-in touchscreen, a 9-speaker audio upgrade, two USB ports and an SD card reader. The SEL ($29,000) has many of those SE options while also bringing a powered tailgate, heated side mirrors, LED lighting and leather-trimmed upholstery. The Titanium ($33,040) packs most of the standard and optional equipment mentioned so far, along with the 2.0-liter EcoBoost engine, keyless entry/start, navigation, a self-dimming rearview mirror, high-intensity discharge (HID) headlamps, a power-adjustable front passenger seat, a powered tailgate with motion-sensing activation, a self-parking system and an upgraded Sony audio system with 10 speakers. Options include a panoramic sunroof, driver attention alert, adaptive cruise control, forward-collision mitigation, lane-keeping assistance and a blind spot monitoring system with rear cross-traffic alert. 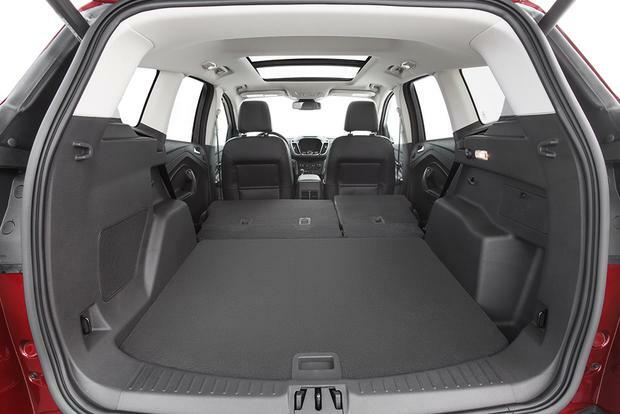 Cargo space with the rear seats up is 34.3 cu ft. That expands to 67.8 cu ft. (pretty good for the class) when a one-touch lever folds those seats down. Every Escape has side-impact airbags in front, side curtain airbags and a driver's-side knee airbag. Four-wheel antilock disc brakes and traction/stability control are also part of the standard safety equipment inventory. The Escape scored four out of five stars in government crash tests, with four stars for front impacts and five stars for side impacts. 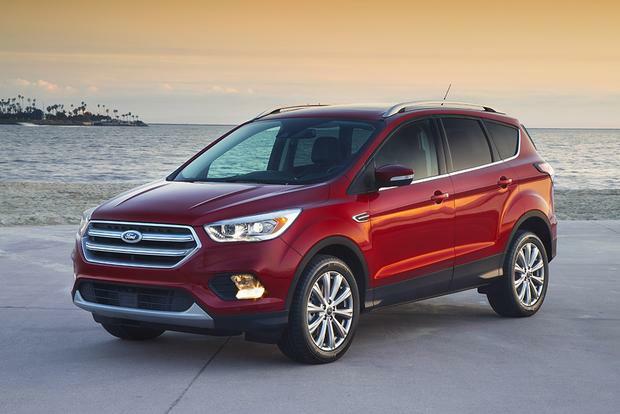 The Insurance Institute for Highway Safety (IIHS) gave the Escape its top score of Good in the moderate-overlap frontal-offset, side-impact and roof strength-crash tests. It was also awarded Good for whiplash protection during rear collisions, but took the lowest score of Poor in the small-overlap front crash test (which has proven to be tricky for many vehicles). 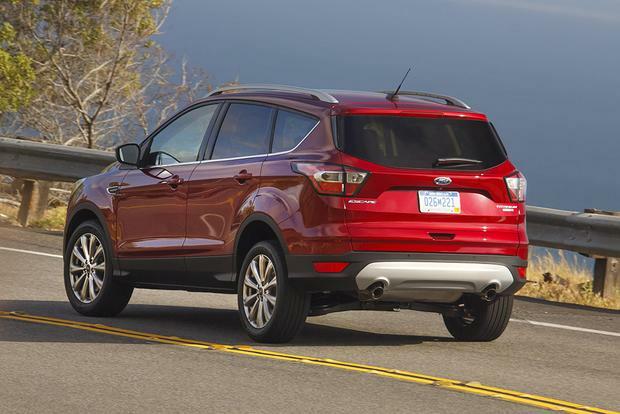 The Escape feels taut and together over bumps. The elevated driving position brings a feeling of confidence and control, as well as good vision. The seats feel a bit narrow, but they're still supportive and comfortable. At highway speeds, the cabin is remarkably quiet, while quality materials add to a generally upscale impression. Ride quality in the mainstream models is excellent. The Titanium's optional 19-in wheels look cool but have a tendency to amplify road imperfections. Try the Titanium's standard 18-in wheels for comparison. The base 2.5-liter engine is competent enough, but it's the EcoBoost engines that really bring the zip. The 1.5-liter engine is more than satisfying in both power delivery and fuel consumption, while the Titanium's 2.0-liter turbo provides acceleration similar to that of some luxury crossovers. Drivers accustomed to V6 power will find this engine hard to resist. 2018 Honda CR-V -- A big seller and deservedly so. Highly capable, but not so thrilling to drive. 2018 Toyota RAV4 -- The range includes a hybrid. In general, the RAV4 is projected to hold its value better than the Escape. 2018 Mazda CX-5 -- As good to drive as the Escape. Deserves to be on any buyer's short list. Updated for 2018. 2018 Kia Sportage -- Good looks, great warranty. Worth checking out. 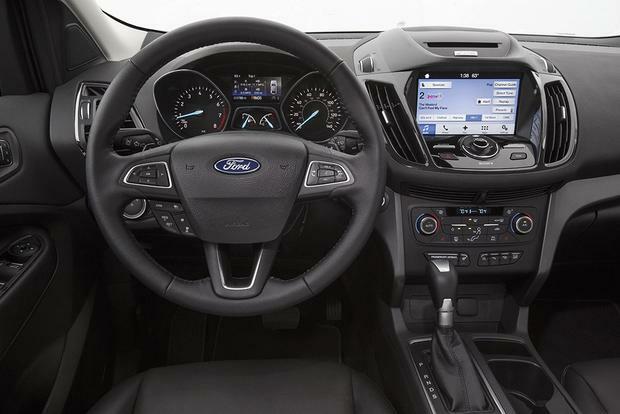 Used Ford Edge -- More space, bigger engines, still entertaining to drive. If the budget allows, go for the SEL trim and add as many advanced safety features as possible.